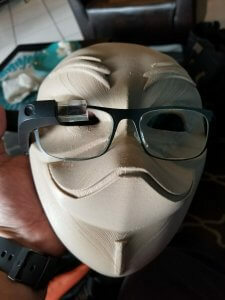 As part of the #Revolutionist76 movement announcement, System76 released a 3D printed Guy Tux Mask and shipped them to several System76 Fans all around the globe. This movement is to promote the fact that people should be in control of their software, not software being in control of the people. You can read more about this movement on the System76 Twitter Page. Furthermore you can join in via Twitter, Reddit and other Social Media Services. I have been the proud owner of the System76 Kudu Pro for almost 2 years and love it. System76 also released the STL files so people with a 3D Printer can print their own. I personally love printing with Wood PLA and have a pretty large 3D Printer so lets get to work on printing this thing. Note : I will be giving one of these masks away to one reader. Instructions on how to enter will be posted at the end of this blog post. Write a Blog Entry on your Website or on a Public Social Media Site showing how important Free and Open Source Software Is To You and how you currently use Free and Open Source Software. Promote your post on Twitter, Feel free to tag me @KeithIMyers and go ahead and use the #Revolutionist76 hashtag. The contest will run from Today (July 2nd), 2017 to July 10th, 2017. I will contact the winner before July 15th. The winning post will also be mentioned on a follow up post on my blog. Note: This mask is unpainted, I encourage the winner to paint it or otherwise show their creative side if they wish. Just post some photos after.